New York Fashion Week, and everything in between. I actually did Google “Fashion” about five minutes ago and did find myself browsing through a long list of fashion-related articles telling me all about NYFW and which designers were showing tonight, etc etc. While reading the articles, I thought “Why not do my own article/post about NYFW but make it more interesting and Konni-Kim-Designs-ish?” So that’s exactly what I’m gonna do. I thought that since all of you can easily find professional, informative articles and gossip about what the hottest designs are in NYFW, and who attended, and what they were wearing to the event etc, I should tell you guys about what I read in between the lines of those fashion articles. How I see it as a 17 year old high school student wanting to be a part of the fashion buzz. When you watch videos of the shows in Fashion Week, you can’t help but notice how gorgeous and stern and god-like the models look. They all have spotless, clear faces and stick-skinny limbs and every single one of them is incredibly tall. Why? I kept thinking, “Why?” Why are these the standards for being a fashion model? Today I asked my best friend if she would model for Konni Kim Designs, because I wanted to do a post about Korean high school students’ fashion. She refused, saying something along the lines of “Find someone else. I don’t think my body is fit to be a model. The clothes won’t look pretty on me.” So I said “But my blog is about real fashion. Actual style in real life. It doesn’t have to be pretty. Anyone could be a model for my blog. Seriously, anyone. You don’t have to be slim or look like Barbara Palvin.” It was a meaningful conversation. At least, to me it was. The reality of the situation is that society does consider a slender, tall figure as “model-like”. Some people say that it’s the body type that accentuates the clothes the best, and that’s why models should be that way, but I disagree. Real fashion isn’t about making the clothes look as pretty as possible, it’s about expressing something. The feeling of looking at a short, plump person wearing a dress is obviously different to the feeling of seeing a tall, skinny person wearing it-but who says the latter is better? The shorter, plumper person can make a certain statement that the taller person would never be able to make. I’d like to clarify that I’m not against tall, slim models. I’m against the social norm that models must be tall and slim. There shouldn’t be a must for models. Since #1 almost turned into a rant, here’s a bit of sunshine from me. I absolutely love the performances in fashion shows. It’s a great way to mix styles and enhance the designer’s message/expression to the public. Sometimes just having models walk around in heels isn’t enough to express what the new collection is all about. Performances show that fashion isn’t just about making nice clothes. In a way, it’s everything. It’s the feeling you get when you see a new dress. It can be the shock you experience when you see Marilyn Manson for the first time. It can be the soft coziness of your favorite fluffy sweater. Performances help you feel those things at a fashion show. Victoria’s Secret is a lingerie&sleepwear fashion brand that’s famous for its creative shows with great performances. Performances from the hottest stars make their lingerie seem more fun and dynamic, rather than serious and dull. 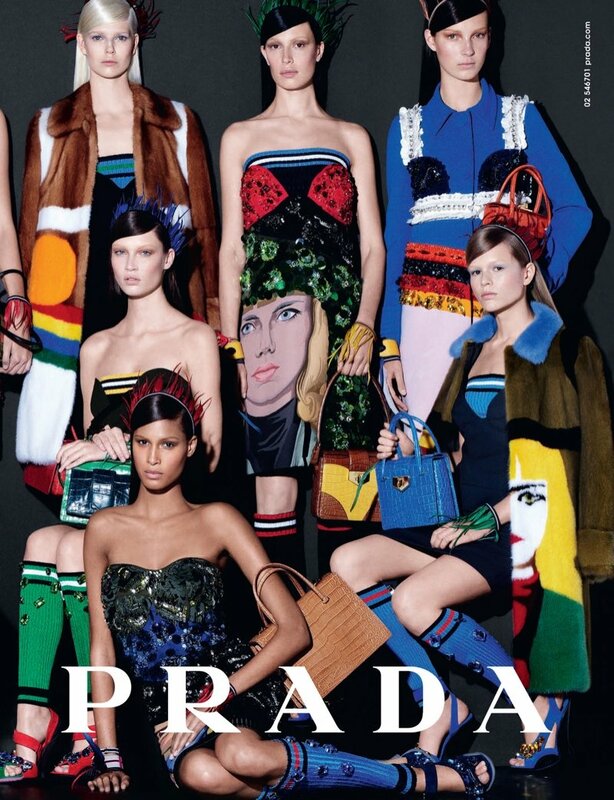 The prestigious high-fashion brand Prada has recently become known for doing this. For example, six artists(Mesa from Spain, El Mac from the United States, Gabriel Specter from Canada, Stinkfish from Colombia, and Jeanne Detallante and Pierre Mornet from France) created murals of women’s faces for the backdrop of a show and for the ready-to-wear pieces. I really dislike how fashion shows have their “seating hierarchy”. Another thing I dislike even more is the exclusiveness of the fashion show itself, especially in Fashion Week. It’s not like a sports game, where anyone can just buy themselves a ticket. Most of the time you have to be specially invited, and only people related to the fashion industry or people who can benefit the brands are invited. For someone who strongly believes in real life fashion that can be applied to the general public, I don’t understand why we can’t all go and see the most prestigious designers’ latest designs. It’s a really big flaw of the fashion world-that it’s so tightly knit together so that “normal people” feel intimidated and excluded. Fashion should stop pretending to be something it isn’t. Come on Fashion, we all know that you’re just like the rest of us. My husband and I were having exactly this conversation in the car the other day. We were talking about why models must be rail thin with no muscle definition, wear about a size 2 and are at least 5 foot 10. My friend once said the same thing, about how thin models keep the structure of the clothes undisturbed, and I understand. But I can’t help but think about all the harmful effects that this ‘physical standard’ is causing, especially since more and more fashion models are being worshiped for their external looks, which contributes to creating a severe lookism society, and insecure teenage girls are desperately trying to starve themselves to look like these models that they see on fashion magazines. Also, although designers/brands may sell more clothes and expand their profit by hiring thin models that accentuate the clothes, I still feel, to a certain extent, that the essence of fashion-true expression-should be upheld(especially when fashion is unfortunately becoming more interest-driven). Since I believe that the real essence of fashion is free, unique expression, I feel that having a wider range of diverity would allow designers/brands to convey different feelings or themes to the public, and the public would be able to truly feel the real splendor of fashion. I actually read that more brands are trying to acquire diversity in their models(physical features, ethnicity… etc), so I guess things will hopefully start to change soon! I really enjoyed reading through this post, it was so refreshing to read someone’s honest opinion on Fashion Week for a change rather than a biased fashion journalist. I love Fashion Week as much as the next guy, but I completely agree with your opinions on the fact that models “have” to be stick thin and on the exclusivity of the event. Well done for getting your opinions across in such a great manner. Hi there! Thank you so much for coming to my blog. I really appreciate it that you enjoyed my post. It’s great to know that someone agrees with me! : D I hope the fashion industry shifts towards diversity and becomes more unrestricted. Thanks again and have an amazing day! This was an incredible read. Thank you for sharing it with us! Nowadays the web is full of poor content however, there is no doubt that you simply spent enough time by editing this article. Again, appreciate your time and then for your efforts! Thanks : ) Sure, I’ll send you an email right now! ← The VERY INSPIRING BLOGGER AWARD goes to…me!